Google wants to push the limits of streaming technology, specifically game streaming. With Project Stream, the company is making the new Assassin’s Creed Odyssey playable in the Chrome browser as a public test. In February 2018, The Information reported that Google is working on a game streaming service and a game console. Project Stream is seemingly the first step. Google describes it as “a technical test to solve some of the biggest challenges of streaming”. The company has partnered with Ubisoft to make the soon-to-be released Assassin’s Creed Odyssey available for free in the Chrome browser on a laptop or desktop. It is an closed beta test that requires an internet connections of 25 Mb/s or faster. Of course, Google is not the first to experiment with game streaming. Sony already offers PlayStation Now and Nvidia has been experimenting with Geforce Now for a while. However, Google believes that there are still significant challenges to overcome. - “The idea of streaming such graphically-rich content that requires near-instant interaction between the game controller and the graphics on the screen poses a number of challenges. When streaming TV or movies, consumers are comfortable with a few seconds of buffering at the start, but streaming high-quality games requires latency measured in milliseconds, with no graphic degradation,” the company explained. 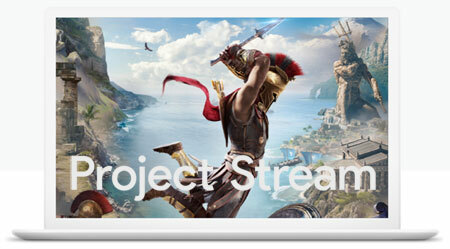 In the video below you see a demonstration of Assassin’s Creed Odyssey streamed at 1080p60 via Project Stream technology to the Chrome browser. Google did not comment on an actual game streaming service or game console. The company has reportedly been experimenting with game streaming to Chromecast, too. Project Stream currently supports the PlayStation 4 and Xbox One controllers as well as wired USB game controllers. The technology is enabled in Chrome on Windows, macOS, ChromeOS, and linux. Google Project Play will let participants in the closed beta play Assassin’s Creed Odyssey starting October 5 until mid-January. You can apply for free here (US only).